Your job is to control Bumblebee who must prevent Terrorcons from resurrecting and going back to Megatron's mother-ship. Decepticons have discovered the place where the Autobots are hiding Energon, so now they're sending out Vehicons to steal Energon from Autobots and use it for making an army of Terrorcons. 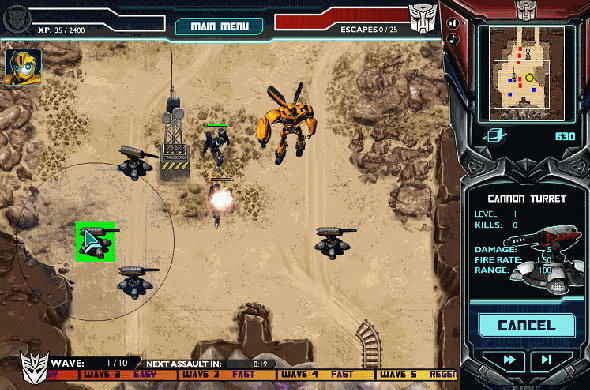 The game consists of 6 missions where the goal is to strategically reposition your forces on battlefield in order to destroy all incoming waves of Decepticons. The first step is to thwart Decepticon's plan to collect Energon from a freshly discovered mine which was opened by some local earthquake somewhere in Nevada desert. This game is licensed/owned by Hasbro so I suggest you to go to the official site to play it. You will start off as Bumblebee, but on higher levels you will get a chance to play as Optimus Prime and Arcee. There are three bosses: Soundwave, Starscream, & Megatron. Level 4 is interested because of controlling 2 Autobots simultaneously. Terrorcons are Megatron's army made out of dead transformers who have been injected Dark Matter. Therefore, they are sort of zombified Autobots, put under command of Dark Forces. Even though usually referred to as 'the undead' they are not quite indestructible. Usually strong energy blast or if being sliced into pieces kills them effectively. Terrorcons have been summoned on several occasions. A good place to look at would be a burial ground with Transformers remains. Even Bumblebee had it's Terrorcon version on one occasion. The name 'Prime' in title refers to franchise from 2010. As addition to cartoon series, Hasbro also released several online games belonging to this franchise, where 'Terrorcon Defense' was one of them. This is tower defense game so the concept of turrets and waves stays the same as usual. At start accept an offer to play with tutorial hints to get familiar with the rules better. Hints are very helpful and very detailed. To place the turret, first click appropriate button on the toolbar and than move the turrent around the map until the circle around it gets green indicating that the location is acceptable for turret placement.